As fondly called by his friends as Editor, it is difficult to find Tsering Wangyal’s profile information and hence resorted in collecting bits and pieces from different sources. Unknown of his primary and secondary education, Tsering Wangyal studied history at the University of Bristol. He had earlier served in the Tibetan exile administration in the 1970s. 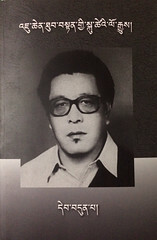 In 1976, he succeeded Dawa Norbu as the editor of Tibetan Review and remained until his resignation in 1996. In 1986, he was hosted by The (Quincy) Patriot Ledger to visit the United States as the fellow of Alfred Friendly Press Partners. He passed away in Toronto at 8:33 pm on 24 November 2000 from hepatitis B. He was 51. (Samphel la wrote he was 48 when he passed away). That spirit is no more. Tsering Wangyal, the editor of Tibetan Review for twenty years from 1976 to 1996, died on 24 November in Toronto from hepatitis B. He was 48. He remained single and was almost monkish in his singleness. But he is survived by his quick wit, his irreverent humour, and his prodigious output in the Tibetan Review. And by what his friends call his “Editor-lese,” a collection of Editor’s puns on people and places that are still passed around with delight in the Tibetan diaspora world and re-told many times over…. Editor had several life-long interests, in books, movies, music, and musicals. His devotion to Broadway musicals was almost spiritual in its intensity. Once to broaden our narrow minds, Editor took us to see Miss Saigon on Broadway. The ticket of $36 each was enough to develop a lasting aversion in us to all such fancy stuff. Our minds were quickly converting the sum into astronomical Indian rupees. But once through the musical we felt as if we had visited Shangri-la itself. Or was it Shambala? “No, that’s Broadway,” Editor thundered. But that wasn’t enough. After the musical, Editor forced us to go through another expensive ritual. Eating at a steak house to express effusive fascination with the experience. However, Editor will most be remembered for his twenty years of stewardship of the Tibetan Review. He and his predecessor, Professor Dawa Norbu, turned a magazine into a venerated institution of the Tibetan exile world and created a whole new generation of Tibetans: the TIBgotes or the Tibetan Review generation of Tibetan exiles. A generation born in Tibet, educated in exile and using the forum provided by the Review to discuss how to redeem its lost inheritance. China has its People’s Liberation Army, but the Tibetan exiles have their Tibetan Review. Pen versus the sword? A favourite topic of debate at Tibetan schools. In the long run, the pen always wins because it generates ideas and inspirations that endure. Editor used his pen or in his case his massive Remington typewriter with thundering rage. He pulled no punches, both against what he perceived as Tibetan government bungling and China’s unrelenting assault in Tibet. In the end the image remains of Editor, shirtless, pounding on the Remington typewrite with his rapid, flowing two fingers, to produce his spontaneous, angry editorials which became the delight of the public and dismay of authorities. Tsering Wangyal will remain the reporter’s reporter and Editor to a whole generation of Tibetan exiles. Source: Obituary on Tsering Wangyal by Thubten Samphel, Tibetan Bulletin January-February 2001. Tsering Wangyal had an uncanny power over words that came with mathematical precision, ‘quick wit and irreverent humour’. During his nineteen years as the editor, Tibetan Review became a standard forum where ideas were debated, ideologies were shaped and shaky policies from both sides of the Himalayas were shredded. His ascetic life was made more attractive by the sounds of his words which echoed in the corridors of the Kashag and Zhongnanhai in equal measure. Editor’s dedication to his profession was also incomparable. The day on which he was to leave for Canada he attended his office at the Voice of Tibet in Dharamshala with his belongings stuffed in a small carry bag. After office that evening, he sat in a bus that wormed slowly down the narrow road towards the plains. It was the last time we saw him. Tsering Wangyal passed away in Toronto at 8:33 pm on 24 November 2000. He was 51. Sino-Tibetan Relations: prospects for the Future, The Potomac Conference, October 5-6, 1992, II. Historical Perspectives: Recent Sino-Tibetan Dialogue/Democratization Evolution of the Chinese Democracy Movement and the Tibetan Issue by Tsering Wangyal. Obituary on Tsering Wangyal by Thubten Samphel, Tibetan Bulletin January-February 2001.